AWB has youth bowling opportunities year round. Programs include Pre-School, K-3, 4-8 and 9-12. 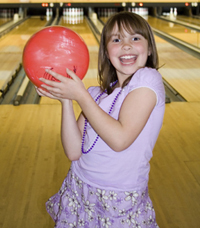 We are dedicated to providing a safe and fun place for youth of all ages to come and enjoy bowling. Sign up by filling out the form to the left. No one "sits on the bench," everyone gets to play! Email our youth bowling coordinator at autowaybowl@aol.com for info on youth bowling. Call 308-832-1935 for more information. Ask about the benefits of assisting with the Youth Bowling Program.